Cast on a number divisible by 6 and 2 extra. 5th Row: Sl 1, k2tog, k1, * yo, k1, yo, k1, sl 1, k2tog, psso, k1, Rep from * to last 4 sts yo, K1, yo, K1, K2tog. Purl 8th row, then repeat these eight rows for length required, usually a square. 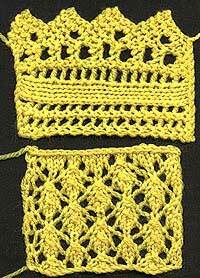 Edge with a knitted lace. 4th Row: k7, p3, k5. 5th Row: sl 1, k1, (yo, k2tog) twice, k2, yo, k2tog, yo twice, k2tog, yo twice, k3. 8th Row: cast off 4, k6, p3, k5. Rep these 8 rows for length around finished shawl. Sew lace around edge of shawl, gathering slightly at the corners so the lace lies flat.